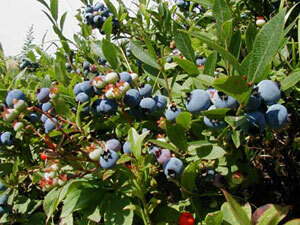 Here in Maine, it was a tough blueberry season because of all the wet weather. Maine blueberries are a special, little fruit. They are quite different from the big Jersey blues. Tree blueberries are giant orbs compared to Maine’s minuscule berries. Big blueberries are ideal for eating out of hand and in fruit salads. Smaller “wild” berries have a concentrated flavor. Therefore, they are more suited for baking and jams. Lucky for flavoristas that Maine berries can be found year round in your freezer section, under the Wymans brand. This is a recipe from Hannaford fresh magazine. It is a fast, fun, low-fat recipe that uses blueberries in a savory way. 1. Prepare chicken. In a medium bowl, whisk together lime juice, oil, black pepper, and salt. Add chicken to bowl and toss well to coat with marinade; set aside. 3. Prepare salsa. Put 2/3 cup of the blueberries in a medium mixing bowl and mash with a fork. Add jalapeno, shallot, salt, cilantro, mint, basil, and lime juice; mix well. Add remaining whole blueberries and mix well. 4. Remove cutlets from marinade and place on grill; discard marinade. Cook until well-marked, about 4 to 5 minutes, then flip to finish cooking all the way through, about 2 minutes more. 5. Divide cutlets among four plates and top each portion with a quarter of the blueberry salsa. Serve immediately.